Posted on July 20, 2017 at 6:53 am. Lottery officials in Thailand are investigating questionable business practices conducted by registered ticket agents which resulted in a local man winning the biggest ever recorded jackpot in the country. Thailand’s Government Lottery Office look set to punish the dealers who sold 30 pairs of pre-printed lottery tickets with the same numbers to a 75-year-old man who won 180 million baht ($USD 5.35 million), triple the payout of the previous lottery jackpot of 60 million baht. The Bangkok Post reported GLO director Maj Gen Chalongrat Nakartit wants to identify the agents, who seemingly traded them among themselves so one dealer could sell a bundle of 30 tickets with the same numbers at a higher price than allowed – a practice which violates agreements made between vendors and the GLO. 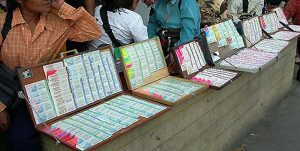 While the trading of tickets among lottery agents is not illegal, no dealer can possess more than one pair of pre-printed tickets with the same number. Luckily for the lottery winner, the GLO are granting him his 180 million dollar baht fortune, as he would be found not guilty of anything related to the shady ticket sale. GLO spokesman Thanavath Phonvichai said overpriced tickets is a major problem which led to the current fiasco, as the government sets the retail price of one lottery ticket at 80 baht maximum, yet vendors often prefer to sell tickets in bundles for higher prices, usually 100 baht. However, if vendors find ticket buyers who are willing to buy bundles with numbers they consider lucky, the prices are often increased excessively. Vendors are also often left with an excess amount of tickets nobody wants to buy, as many players aren’t interested in buying tickets with certain perceived unlucky numbers. A recent amendment to the Lottery Act in Thailand has upped the penalty for vendors who try to get away with selling overpriced lottery tickets – up to one month in prison and a fine of up to 10,000 baht. A new scheme will be proposed to the GLO board in the wake of the 180m baht jackpot win, pushing for jackpot roll overs if no winner claims the prize. Any money left unclaimed would then pass to the next draw, with a maximum jackpot of 600 million baht if ticket sales pass 1 billion baht. For comparison, the current jackpot cap for an 80 baht ticket is 6 million baht. While the plan drew mixed responses, the GLO leadership hopes it will deter underground lottery ticket vendors, and that recently passed draft amendments for Thailand’s 1974 Lottery Act, which currently does not permit rollovers, are put up for public feedback soon.